When it comes to improving pain management scores, and improving pain management in general, we must consider that there is not one singular solution. Hospitals that are willing to work together inter-departmentally to assure their patients feel that their pain is being addressed, will be rewarded with an increase in positive feedback from the people they serve. Often times, this requires putting departmental pride aside and reaching out to other health professionals to create an environment that allows our patients to hear the same information from several sources. By encouraging interaction with and reiteration by physicians, nurses, pharmacists, and other healthcare professionals, patients have a better chance to receive, understand, and truly learn the information being shared. In this way, patients become a part of their own care and healing and have insight into both their treatment and the likely duration of their discomfort. Doctors are typically the first person that a patient thinks of when he is suffering from an ailment or disease. Your patient in the hospital has had at least some interaction with a physician on his path to his current condition. Patients also tend to understand, though, that while doctors may round occasionally, they will not be their main contact during their hospital stay. Most patients, however, trust the physician’s word more than any other he will hear during his stay. When the physician does arrive in a patient’s room, it is imperative that she spends time truly listening to her patient, answering questions, and explaining methods to address the patient’s pain. Beyond these basics, physicians must manage up the nursing staff as partners in their pain management, and discuss their pain goals with the patient as an active member in their care. This interaction with the doctor assures the patient that his primary contact is still involved in his care and that the nurses, who are in more constant contact with him, are working in agreement with the physician. Patients will have more interaction with their nurses than with anyone else in the hospital. This first line of care is one of the most important components in determining the patients’ perception of their hospital stay. Nurses have the opportunity and responsibility to educate their patients when it comes to medications. By communicating often and honestly, nurses are in the best position to help a patient set realistic goals about his pain management. The reiteration of the name of their medication, the reason the medication was prescribed, and the potential side effects help educate the patient and include them in their own healing. Nurses also have the chance to reiterate the suggestions of other health professionals – it is the nurse who can remind the patient to call for help before attempting to walk alone (“like your physical therapist told you”) or to try to eat (“remember your doctor wanted to you to drink 8 ounces by mouth”). This unique position of offering care while managing up your fellow healthcare workers puts nurses at the forefront of the collaborative care effort. Of course, the other health professionals that interact with the patient should also be repeating information about medication, precautions, and goals as necessary. 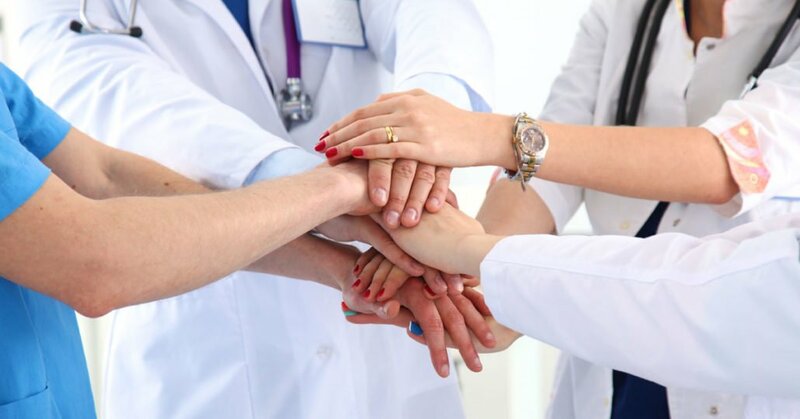 While that may seem redundant, knowing that the there is a team of health care experts collaborating together on their behalf offers an assurance that is invaluable to the patient. Pharmacists are an essential part of increasing a patient’s confidence in her healthcare and, as such, should be included as a patient educator whenever possible. Pharmacy is defined as the art, practice, or profession of preparing, preserving, compounding, and dispensing medical drugs. Taking a prescription from a physician and delivering the exact medication to treat a patient truly is an art form. And, while we, as healthcare providers, interact and distribute medication every day, the pharmacist is the best choice to explain to the patient the reasons for and ramifications of any medicines he is taking. Research has shown that rounding by pharmacy managers improves education and minimizes errors from non-compliance. In hospitals where pharmacists round, patients have a better perception of their pain management and medication communication. The idea that they are receiving a collaborative effort in regards to their healthcare increases patients’ overall outlook of their hospital stay. Patient interactions are not limited to physicians, nurses, and pharmacists – there are scores of other health professionals who will spend time with the patient during her time in the hospital. Therapists, technicians, and dieticians will all take part in a patient’s care plan and should be working with the other healthcare providers to create a cohesive plan. They should be reiterating parts of the plan that have already been established and communicating additions to the care of the patient that fall under their expertise. A patient who sees and experiences the collaborative care of all her health professionals working together with her will have a much more positive outlook on her care. She will also have a better understanding, albeit with more realistic expectations, of her healing and pain management. This environment of interdepartmental cooperation must start from the top down. A culture shift within a hospital must be lead by an administration who appreciates the benefits of collaborative care for their patients. Administrators must understand that cooperative care changes the outlook of patients on their overall stay in the hospital by making them feel considered and valued. There must be leadership in creating a patient-centered culture. Hospital administration has to lead the charge in making resources, training, and focus on the patient experience a priority. Once it is clear that the patient has become the heart of the hospital, staff will adopt and embrace this belief. Slowly, this philosophy will trickle down to directors, managers, and front-line staff and create an Always Culture for every patient who enters your doors.